My mum asked me to make a starter for Christmas dinner and I was faced with a problem. Between the six people who would be there, dislikes included: salmon, prawns, pate, salad.... I decided I would be safe with cheese. I also knew it had to be something I could prepare the day before and transport down to my parents, and that my mum wouldn't have a lot of space in her kitchen for preparation or oven for cooking. So the easiest thing, and something I thought we would all enjoy, was baked camembert. You simply buy a whole round camembert (or two, in this case), and put them in the oven for about ten minutes for them to melt. Then you dip bread or veggies into the cheese and enjoy. You could do these if you are having people over on new year's eve, though they are good at any time! I did want to make something though so I decided to do homemade bread sticks. I'd never made them before, and hardly ever make bread, so I was pleasantly surprised to see how easy these were, and how well they turned out. I used this recipe from BBC Food but adapted it slightly. Add the yeast and sugar to 280ml warm water in a large bowl. Add 75g of the flour, whisk and leave for ten minutes for the yeast to activate. Add the oil, remaining flour, parmesan and blue cheese, herbes de Provence and garlic and mix well to form a dough. Knead for about 5 minutes then cover the bowl with cling film and leave for half an hour. Preheat the oven to 190C. Mix the parmesan, herbes de Provence and piri piri seasoning for the rub in a small bowl. Roll out the dough to a long rectangle and brush with beaten egg yolk, then sprinkle over the rub. You only need to do this on one side. Use a pizza cutter or a sharp knife to cut strips of the dough. Gently twist each one, and stretch a little as you do so, and place on a lined baking sheet. Bake for about 12 minutes until golden brown. I did these in three batches and by the end had a pile of 16 bread sticks. They were quite large - both longer and thicker than the ones you buy in the shops - so I think you would only need 2 per person. I'm sending this to Four Seasons Food, the blogging challenge hosted by Anneli at Delicieux and Louisa at Eat Your Veg as their theme this month is festive party food. 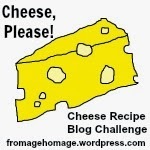 I am also sending this to Cheese Please, hosted by Fromage Homage, as the challenge this month is to make festive nibbles using cheese. These bread sticks contain two types of cheese and are designed to be dunked into cheese, so you can't get more cheesy than that! Oh, bread sticks are lovely. This flavour combination sounds especially winning. Have a great week, Caroline! they were very nice--we all enjoyed them. Restaurant Reviews - Washington D.C.